A mother's pride lit up Crystal Holcombe's Facebook page on Friday. Daughters Emily and Megan had finished third and first in their respective categories in a 4-H bakeoff and displayed their handiwork in posted photos. But on Sunday afternoon, the page went grim. "Keep the Holcombe family in your prayers," a friend posted. Crystal Holcombe, who was eight months pregnant, was among the 26 killed by a lone gunman wielding an assault rifle, most as they worshipped at the First Baptist Church of Sutherland Springs, Texas, said her cousin, Nick Uhlig. Uhlig told The Associated Press that Holcombe's in-laws were killed, and he told the Houston Chronicle that three of Holcombe's children were killed, among at least a dozen, according to the local sheriff. "She doesn't even drink, smoke or nothing," he told the newspaper. "She just takes care of kids; she raises goats and makes homemade cheese. That kind of thing, you know? They don't go out dancing or anything like that. They're real old-fashioned, down-to-earth." Holcombe's grandfather-in-law told The Washington Post that a total of eight members of the clan died, including his grandson and infant great-granddaughter. The father-in-law, Bryan Holcombe, had done prison ministry, said Uhlig. "He would go up to the prison with ukulele to sing." The massacred churchgoers ranged in age from 18 months to 77 years, state police said. Twenty others were wounded, including 10 still in critical conditions on Monday. "Most of our church family is gone," said Sherri Pomeroy, wife of the church's pastor, Frank Pomeroy. "Our building is probably beyond repair. The few of us that are left behind lost tragically yesterday." Annabelle Pomeroy, Sherri and Frank's 14-year-old daughter, was killed. Both Frank and Sherri were out of town, in different states, on Sunday. "As senseless as this tragedy was, our sweet 'Belle would not have been able to deal with losing so much tragedy yesterday," Sherri Pomeroy said on Monday morning. "Please don't forget Sutherland Springs. Twelve to 14 children were found dead inside the church, according to Wilson County Sheriff Joe Tackitt. "You don’t understand, you lean into the Lord," Frank Pomeroy said on Monday morning. "Whatever life brings to you, lean on the Lord rather than your own understanding. I don’t understand, but I know my God does." Another of those killed was the 13-year-old goddaughter of Amanda Mosel, she told the Express-News. Hank Summers, a local who had moved to San Antonio, told the AP via text message that his uncle, David Colbath, survived five gunshots that required extensive surgery and skin grafts to save an arm. The gunman who killed 26 at a Texas church had a “mission” and a “purpose,” law enforcement officials said. The gunman was shot twice before shooting himself in the head, officials said. 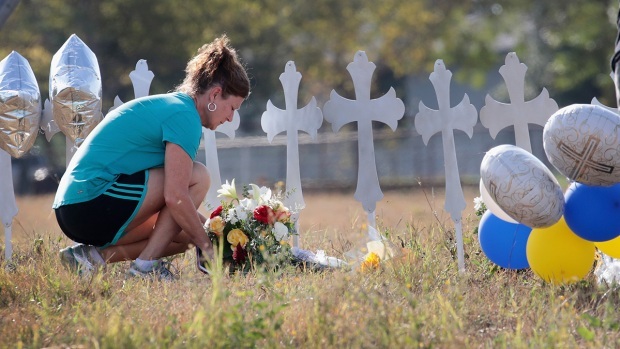 Sutherland Springs is a tiny town where everyone knows each other, said L.G. Moore, who runs the Holiday RV Park, which is 1/4 mile from the church. Everyone in town was apt to know someone who was killed, he ventured. "They say the population is 400 and that's if you count every dog, cat and armadillo," Moore, 75, said over phone. "It's more like 200 people." CORRECTION (Nov. 6, 2017, 12:50 p.m. ET): An earlier version of this story misspelled Sheriff Joe Tackitt's name.